This is a tiny houseboat, but has everything! Tiny houses … and tiny house boats … and here is a very tiny house boat indeed. It’s only 75 square feet, or 23 square meters. How about that for a small house? 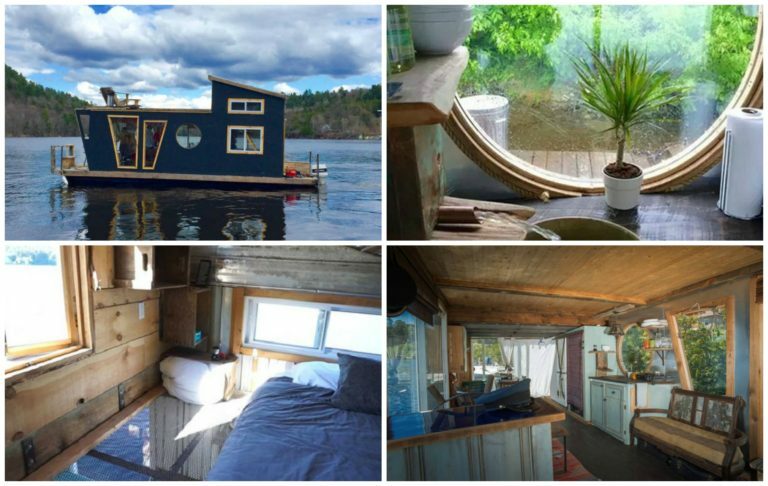 However, this tiny house boat is used throughout the year, and in a cold country: Canada. It’s located on the Gatineau River in Chelsea, Quebec, and it’s actually rented out all throughout the year. 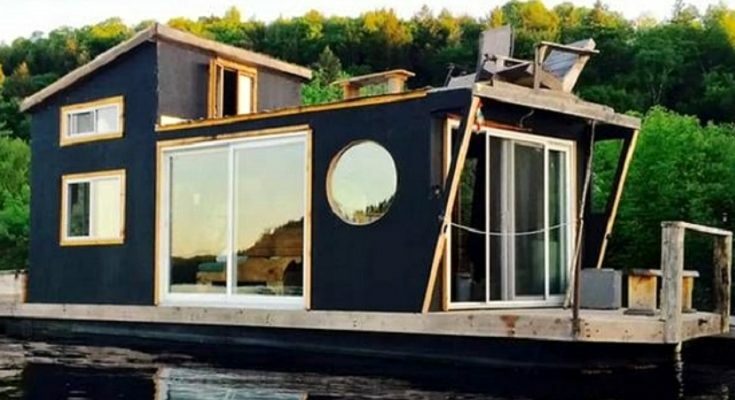 This tiny house boat is called the “River Den” and it rests on 5 30 foot pontoons, giving it 20,000 pounds of floating capacity. It was locally built by by a Quebecois boatbuilder out of cedar, steel, copper, tin and aluminum. The walls are throgouly insulated with efficient thermal insualtion, and the tiny house boat has double glazed windows. For heat, the houseboat has an antique oven, which is also where heat for cooking comes from. The sleeping area is in the loft up top, and the bathroom has a composting toilet and a shower. Overall, the tiny house boat here is completely custom, locally built, and constructed with eco-friendliness and economical thriftiness in mind. For more tiny homes, find them in the Building Homes and Living directory.